Phoenix, AZ – Dr. Steven H. Turkeltaub, a board-certified plastic surgeon in Phoenix, believes the emphasis on beauty in society can cause appearance to be very important for one’s social life, career advancement, and self-esteem. At the Arizona Center for Aesthetic Plastic Surgery, his private practice, he offers his patients both the standard tumescent liposuction as well as ultrasonic-assisted liposuction to help treat their unwanted, persistent fat and allow them to realize a more sculpted and desirable look. According to the Phoenix plastic surgeon, the ideal liposuction candidate is a person who is in good overall health and who has localized fat deposits. He says this allows for more dramatic and precise sculpting of various areas of the body. Dr. Turkeltaub also states that even patients who are at or near their ideal body weight may have localized fat deposits that fail to respond to diet and exercise. He strongly emphasizes that liposuction is not a weight loss solution and it should not be used indiscriminately for the widespread removal of fat because this can lead to a variety of significant problems including very serious acute health issues. Dr. Turkeltaub explains that ultrasonic-assisted liposuction utilizes ultrasound waves to disrupt the fat, allowing for easier and more even fat removal. In some areas, it does provide for an increased margin of safety as compared to traditional liposuction. Tumescent liposuction involves the injection of a fluid containing both an anesthetic and vasoconstrictor into the targeted fat prior to beginning the liposuction. The advantages of this approach are that it significantly reduces blood loss, reduces bruising and minimizes postoperative discomfort. It is an integral part of ultrasonic-assisted liposuction and can be used with standard liposuction. At the Arizona Center for Aesthetic Plastic Surgery, liposuction is usually performed under general anesthesia for the comfort of the patient. Unless very large amounts of fat are removed, the procedure is done as an outpatient procedure. Most of Dr. Turkeltaub’s Phoenix plastic surgery patients are physically active within the first 24 to 48 hours. They are instructed to refrain from engaging in sports and other vigorous physical activities for around two and a half weeks. Most of the discernible swelling will resolve by 4 – 6 months. However, it may take up to a year for patients to see the “final,” long-term result. 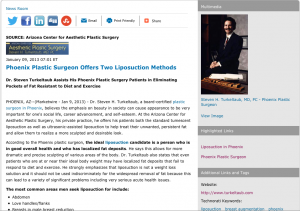 Dr. Steven Turkeltaub is board certified by the American Board of Plastic Surgery. He earned his undergraduate and medical degrees from the Six-Year Medical Program at Boston University and Boston University School of Medicine. He has authored several papers, articles, and textbook chapters on plastic surgery that have appeared nationally in numerous magazines and newspapers. Dr. Turkeltaub is dedicated to providing the Phoenix and Scottsdale communities with a comprehensive span of plastic surgery procedures ranging from breast augmentation to BOTOX® Cosmetic. He is available for interview upon request.